Winner of the prestigious national book award, the RITA, science fiction romance author Linnea Sinclair has become a name synonymous for high-action, emotionally intense, character-driven novels. 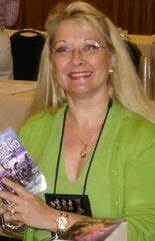 Reviewers note that Sinclairs novels have the wow-factor in spades, earning her accolades from both the science fiction and romance communities. Sinclairs current release is HOPE'S FOLLY and, scheduled for 2010 from Bantam Dell, REBELS AND LOVERS, book #4 in the Dock Five Universe. A former news reporter and retired private detective, Sinclair resides in Naples, Florida (winter) and Columbus, Ohio (summer) with her husband, Robert Bernadino, and their thoroughly spoiled cats. "I was captivated by Dushau, thoroughly in the main character's court from the first chapter, and amazed at how effortlessly Lichtenberg drew me into such alien yet believable minds and worlds." "Explores loyalty, politics, intrigue, and desire... a riveting read." "A tightly written, edge-of-your-seat read." "A definite star on the rise." "Science fiction, political intrigue, romance and adventure... all deftly woven together..."
"Gripping characterization, non-stop action, fascinating biological speculation, and a dash of romance. Don't miss it!"